I've been kinda crazy busy the last while. Most of the work I've done has not printed yet. Here's some more Motor Trend art which is always fun for me. 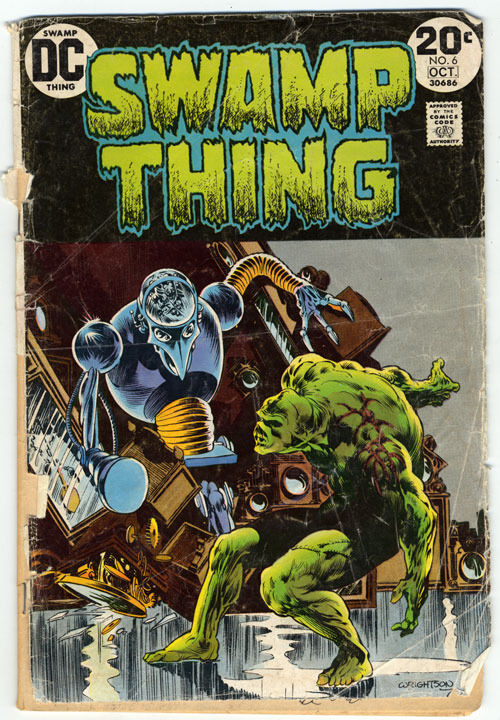 After reading Harry's post I looked at the my old Swamp Thing copies. Bernie Wrightson made my head rock. That is the coolest snake head I've ever seen! 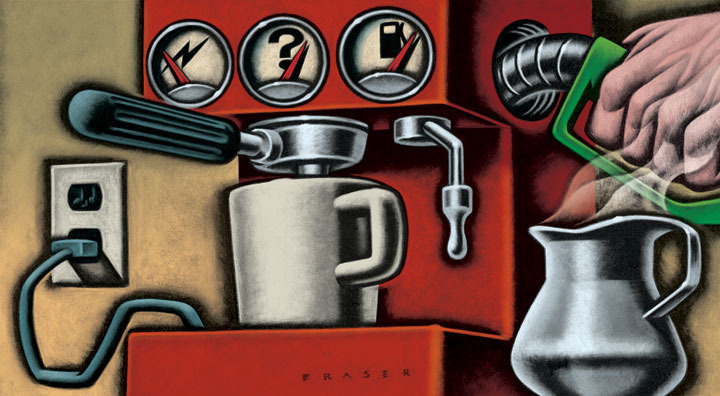 Great stuff, particularly the espresso machine, and great idea. And oh the colors. Love hearing about the early years of so many artists like yourself that I admire and seeing that we all share very common beginnings, getting lost in our drawings, having such a love for these artists that we would mark the day that new issues came out and then ride our ten speeds down to-Krauzer's, in my case. I have to tell you Doug that you were/are one of these guys that I saw as at the top right about when I was graduating art school, though we are probably close in age. Along with Matt Mahurin, Brad Holland, etc. I remember seeing your work at a small gallery downtown along with a few others I don't recall. Was it the Illustration Gallery? Your work has just as much life now as then-as evident in that espresso piece. Some people would get complacent with success. The hand in the espresso image is so solid. Doug, have you seen Wrightson's illustrated Frankenstein book? So cool, Doug! 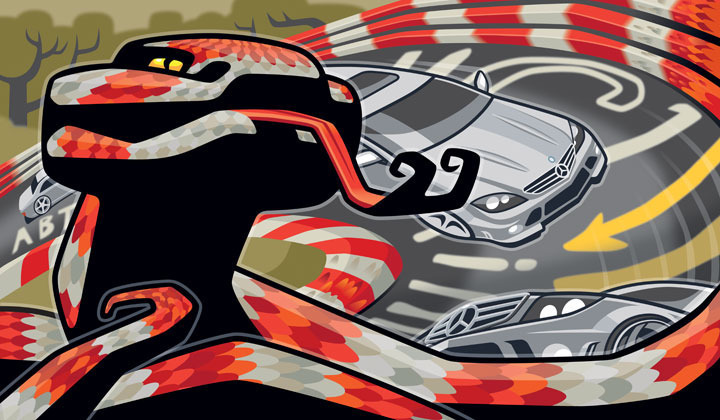 The Benz image feels like an amusement park ride I would definitely want to try. It also makes me think of kids' crazy board games. I think its awesome that you get such energy into your pieces. Also, the Bernie Wrightson Frankenstein book is pretty amazing. If I recall correctly, its $30 for the hardbound, but its a beautiful book. Wrightson's style in the book is very Franklin Booth, so you may want to check him out as well? Alex, thanks. It was fun designing that snake. The head has influences of a car body shape I like. Harry, thanks as well for your complimentary recollections. Also, it was the Illustration Gallery on East 11th. Pam Somers ran the gallery. She went on into working in book publishing, great lady. Kyle, I have seen the Frankenstein book. He also drew the most impressive werewolf to that date(April-May issue 1973) for the Swamp Thing series. Great stuff, Doug. I love the snake and the texture on the rail, it looks an Alloy Fiber or something. It would make an awesome bike frame. I also collected comic books as a kid and saved my entire collection. Last winter I had a leak in my attic that I didn't know about and it ruined a bunch of them including a perfect copy of Ironman #1, be careful where you store your collectibles. I remember standing at the round comic stand at the little market for hours, checking out every comic, making my decision to spend 25 cents on one 80 Page Giant or two 12-cent comics. Meanwhile, my friend perfected a technique of placing his school books down on the stack of Playboys and picking up the top issue with his books on the way out. I'd like mine electric, hold the gas, please. That's a snake head like no other! Chris, I've been a fan of Bernie Wrightson for decades. Also the work of Joe Kubert, Alex Toth, Jack the-one-and-only Kirby ...... on and on. And thats just in the world of comics. Richard, I wanted to represent the metal gard rails morphing from snake scales in a simple stylized form. The Nurburgring is getting old, and strangely it has a lot of graffiti all over the track surface. Paul, ah those magazines were always on the top row at the back of the stand so as to make it difficult to reach. Cathleen, cappuccino or espresso?...2 shots? Just great from concept to finish. digging the volume of that snake. Doug, I like my coffe light and sweet and made just right. Sorry for the double post there Doug, I meant to say you made it just right. Love the Snake Track Doug!! I dont know if you recall these but TYCO Toys race sets use to come with snake tracks. They were bendable and everything. Ahh, they 80s man..pretty cool stuff back then. Oh, yes Kirby and Toth are amazing. I buy the Essential Marvel trades just to see Kirby's art without color. Great stuff. Also, Sidebar Nation did a tribute podcast to Toth recently. Haven't listened to it yet, but they are huge Toth fans and have access to lots of his peers and colleagues including Mark chiarello. Thought you may be interested. Mark, no I didn't see the TYCO track. Does sound pretty cool. Chris, thanks for the heads up on the podcast. I'll definitely look into it. Doug!... I've been a quiet follower for sometime, and just wanted to send my regards on your work. I work in graphic arts and web- and back in college I started keeping up with Pacific-West area illustrators... Definitely glad I'm keeping track of your work. Your Volkswagen series never leaves my mind. Glad I found your blog! Take care.